This tracing shows the standard limb leads recorded with the Cambridge apparatus. In fact this is an historical recording because it is the electrocardiogram of Sir Thomas Lewis taken a few months before his death in heart failure from coronary heart disease. He had sustained myocardial infarctions 16 and 11 years previously. 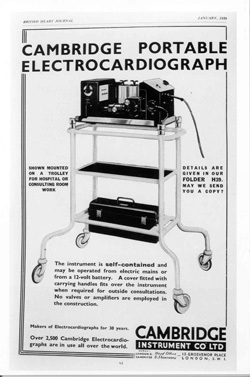 This advertisement for the Cambridge electrocardiogram shows it on a mobile stand. The original string galvanometer of Willem Einthoven designed in 1901 took excellent records but it was huge and took five men to operate it. The Cambridge Scientific Instrument Company designed and produced a superb smaller instrument in 1909 and by 1911 a complete clinical outfit was available and supplied to Dr Thomas Lewis. 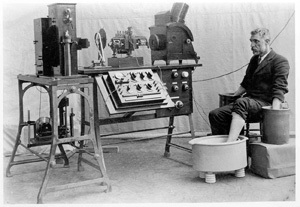 This photograph shows this apparatus in Lewis’s laboratory at University College Hospital Medical School. Limb leads were recorded via tubs with 20% salt solution and the subject is Mr Frost a Cambridge company technician. 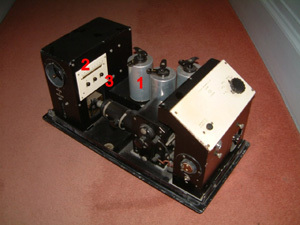 The galvanometer is in the centre of the table with an arc light source on the right whilst the stand on the left has two recording cameras on it. 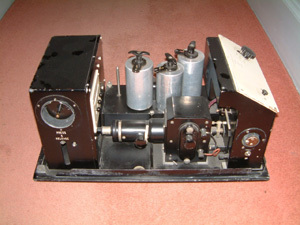 Lewis used this apparatus also for his outstanding electrophysiological work on the dog heart mapping out the spread of the excitation wave over the atria and ventricles. 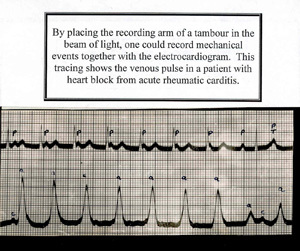 By placing the recording arm of a tambour in the beam of light, one could also record mechanical events together with the electrocardiogram, using all 3 channels at once. This tracing shows the venous pulse in a patient with heart block from acute rheumatic carditis (P wave on previous QRS).